Embodying the beginnings of Melbourne Grunge circa early nineties the stories in See Through come from the seminal self published collections Black, and Snakeskin/Vanilla. Filled to the brim with stressed, working class characters who are running out of time, money and mental health, these people exist in the social margins and survive in the wastelands of the urban sprawl. Boyack’s characters are shards of smashed mirror on a bathroom floor, reflecting bits and pieces of environmental neglect, pub brawls, football club culture, and the gut wrenching personal devastation of experiencing rejection from lovers. With an Introduction by Ian Syson (The Vulgar Press) and an updated author’s note, 20 years on, this is a pointed, lusty, bleak package. Boyack did his apprenticeship in realism writing these stories, and in a tradition of Grunge wrote them with nothing to lose. His eye for detail excels, along with his trust for the reader, and his strong ability to write freely in his own vulnerabilities. Fat, the lead story in this collection, was henpecked and championed simultaneously at the time of its release; yet, it survived on a university curriculum for a decade or more. 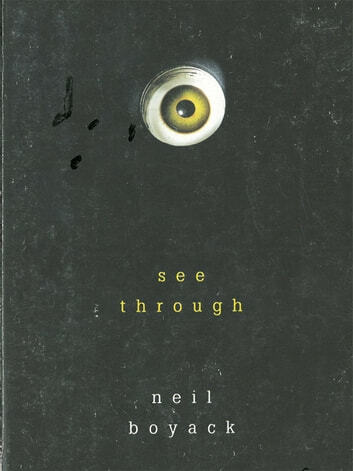 This version of See Through contains the story Spit which was not in the original release. It also contains the manifesto that kicked off Black in 1993. Like it did when it was released See Through will repulse as many people as it entrances.